I call this column "On The Record" because it's designed to share a view of recorded music most of us don't get to know: the artist reflecting on his own work. We'll explore how a musician's playing evolves on record – which songs hold up for him, which don't, and why. We'll look at technical aspects of recording, as well as what the songs mean to their creators. There'll be reflection on the past, insights into present works, and thoughts about future projects. We kick it off with Frank Zappa. There's no middle ground with Frank Zappa If you've heard his music, you love it or you hate it. Deliberately demanding, it's an intrusion either welcome or unwanted, but never in the background. 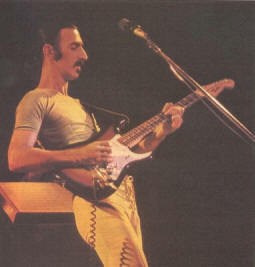 A true fusionist (who rejects the term), Zappa was mating elements of jazz, R&B, R&R, modem classical and Middle Eastern modes long before McDonald's sold their first million. 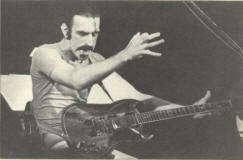 A controversial lyricist and a unique guitar stylist, Zappa has been called both genius and junk dealer. His response? F.Z. Let's look at it from the standpoint of logic. There is a way unless you're dead, and even they there is still a question, that you're not going to offend somebody. There's always someone that's going to get offended over something that somebody does. That's human nature. Just sitting still you can offend people, so why worry about it? You can't win. I was never meant to be a man for all seasons. Am I here to entertain everybody? No, just the ones who like what I do. The ones who don't like it, like somebody else. G.W. Using the theory of Musak, do you think we're being taught not to listen? F.Z. Do you remember the theory of Musak? It's that certain types of audio wallpaper produce certain types of physical results in terms of job output and mood alteration. You can see that it's to the government's advantage that all radio be made a logical extension of the Musak concept of life. In other words, AM radio, which is so pervasive, contains psychological information that modifies your mood. Your selection of a station is like your vote for a certain type of lifestyle. If you're a jazz guy, you turn to a jazz station and suddenly your room is filled with audio wallpaper that reinforces your lifestyle. If you're into heavy metal, you go for that kind of audio wallpaper and all it does is reinforce your idea of who you think you are. G.W. Rather then creating a mood, your music seems to demand that people listen and react. F.Z. It's participatory. The music should interact with the person that's listening to it. What I do isn't designed to reinforce your lifestyle. It's coming from a different place: it's not product. Ultimately everything that gets released by a record company turns into product, but the intent of what I do is not product oriented. I've got something to say. I've got certain ways that I want to say it and I take great care of the preparation of the material. I see it through all the way to the mastering process. G.W. Are you happy with everything you release? F.Z. There are certain things that are better than others for a number of reasons. The most recent albums, I think, are improvements over the older albums. The new contract I have gives me more money to spend more time to make better albums. When I was with Warner Bros., the budgets they gave me to prepare those albums were so low it was difficult to even be competitive. G.W. Musically would you give your albums equal rating? F.Z. Yes and no. There's different music in there. You take an album like "Live at the Fillmore" in 1971, that's kind of a vaudeville record. I don't think that compares to "Lumpy Gravy," which is in a different realm altogether. But there are people who prefer the "Fillmore" album to "Lumpy Gravy," even though I think "Lumpy Gravy" is the better record. "Joe's Garage" is probably a better record than "Sheik Yer Bouti," but there are those that think differently. It depends on your orientation. I have my favorites of the batch. G.W. Obviously "Lumpy Gravy" is one of them. Why? F.Z. Because the idea of it is just off the wall. to chop up dialogues and rhythm and stuff, and edit that together into an event. It's more of an event than it is a collection of tunes. G.W. "Joe's Garage" also seems to be a personal favorite. F.Z. It's because of the way it started versus the way it ended up. It was originally a group of songs that had nothing to do with each other. One weekend I decided that I would write continuity into it and make an opera out of it. By golly, I did it, and the story line makes sense, the songs are good, and the album is well produced. I think the vocal performances are really great. It's a good sounding recording and a nice package. G.W. Looking back throughout the years, do you have any favorite compositions? Make It, Dynamo Hum and Who are The Brain Police. G.W. I'd have to put Peaches in there. F.Z. Peaches is a classic That's probably the ultimate across the board Frank Zappa song of all time. It's the only thing I've never heard anybody say they didn't like. G.W. Do you have any favorite guitar moments? F.Z. I don't think so far there's been any really good solos released on records. Ultimately, I hate them all as soon as they're out. In the case of a live album, the day you have the 24-track truck may not be the day you played your best. G.W. Your guitar solos don't seem to be climax oriented. F.Z. I don't play for effect, I play for music. I play for my own amusement, and if somebody else likes it, that's fine. If they don't they can go see a guitar star someplace. G.W. Regardless of your intention as a player, you are still among the handful of original stylists on the electric guitar. I hear you combining blues with Middle Eastern modes. F.Z. There's a lot of stuff in there. As far as style goes, a person can only recognize an element of style based on things of their own experience. If you've heard Eastern modes you can identify them. If you've heard blues, then you'll be familiar with that. But if you don't know anything about contemporary music, then you will not hear that part. So most people don't realize that what's going on in there rhythmically is probably pretty far out. G.W. Do you have plans for your next album? F.Z. I've already finished it. It's a three-record live set with no overdubs and probably more guitar playing than I've ever heard in any of my albums. G.W. Good stuff or more O.K. nights? F.Z. I think we have some memorable experiences in there.